Have you been injured in an accident at work or in a car crash caused by someone else? Are you trying to find the right lawyer to help you get the compensation you need to put your life back on track? If you have tried contacting big-name law firms with dozens of attorneys, you may be feeling ignored—as if they see you as just another case to add to their already lengthy list. At Hoggatt Law Office, P.C., we believe it is unacceptable to treat clients this way. You have already suffered enough; you do not need more stress and aggravation from your attorney. When you choose our firm, our lawyers become personally invested in both you and your case. While we are a small firm, our size is one of our most important strengths. It allows us to offer you the skilled, responsible representation you need along with the personal attention and care that you deserve. 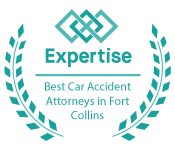 For more than 15 years, the personal injury attorneys at our firm have been representing injured auto accident victims in Wellington, Colorado and the surrounding areas. We handle a full range of traffic accident cases, including car, truck, and motorcycle crashes of all kinds. Whether your accident was caused by a drunk driver, a distracted driver, or a poorly maintained commercial truck, our team is equipped to help you pursue full compensation under the law. Our lawyers realize that insurance companies are often difficult to work with following an accident. Insurers may try to downplay your injuries or to blame you for the crash itself. We will not stand idly by and allow you to be taken advantage of by insurance companies and their attorneys. Instead, we will work hard to secure a favorable settlement on your behalf. If a settlement is not possible, we are prepared to take your case to trial. Every occupation has its risks, and each year, thousands of workers are injured on the job in Colorado. If you have been hurt at work, you may be eligible to collect workers’ compensation benefits for your medical expenses, time away from work, and disability. Benefits for vocational retraining may also be available if you are not able to return to your current job because of your injuries. It is important to report your injury to your employer as soon as possible, and then contact an attorney at our firm. We will assist you with filing your claim for benefits and provide the guidance you need at every stage of the process. If you have been injured in an accident, contact our office to discuss your available options. Call 970-225-2190 for a free, no-obligation consultation with a member of our team today. Our firm represents clients in Wellington, Larimer County, and the surrounding areas.